New. Trade paperback (US). Glued binding. 267 p. Contains: Illustrations, black & white, Figures. New. Sewn binding. Paper over boards. With dust jacket. 257 p. Contains: Illustrations, black & white, Line drawings, black & white. Borzoi Books. Gary Taubes has taken the extensive research he did into published scientific papers and written a very sensible, helpful, readable book. His first one, which goes into more detail and is the longer version (500 pp, instead of 200 pp.) is more difficult to follow, especially for a non-scientist. However, WHY WE GET FAT makes the same points: dietary carbohydrates (especially sugar and starch) are uniquely fattening. Calorie for calorie, they are more fattening than either protein or fat. Furthermore, a low-carb -- and therefore higher fat -- diet can help prevent not just obesity, but also diabetes and heart disease. I recommend this book highly. Quick read. A logical presentation of studies done, misinformation you've received, what is going on in your system and why. Let's you make informed decision concerning food! If you want to sort fact from fiction - this is your book! As all who have struggled with their weight know, the USDA and government officials don't really have it right. Forget the food pyramid put together by government bureaucrats who then wring their hands as to why Americans are fat! Read this book - it will open your eyes. It was written well and easy to understand and gave me a lot to think about. If you are trying to get healthy or reduce your weight it is worth reading. Or, it is interesting if you are into nutrition. OK, I actually read Good Calories Bad Calories and liked it. However, I could not recommend it to anyone. It was a somewhat tedious read and to long for the average person. 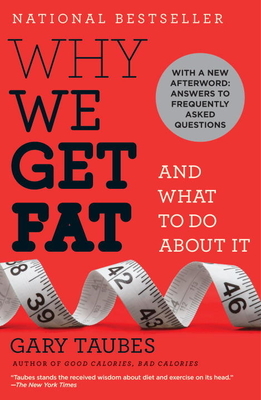 This book, Why We Get Fat, however is a easy read that is very enlightening. I recommend it. Gary Taubes did a great job of writing this book for the average person. I think his message is right on target and if people would read and apply this information there would be a lot less "diet grumpy" people and a lot more lean and healthy people.